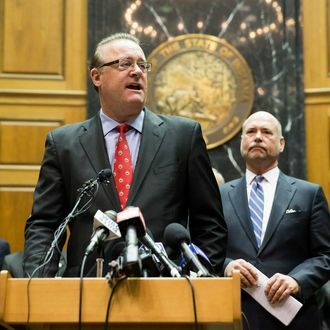 A new bill that would alter the week-old religious-freedom law in Indiana will soon head to the state’s House and Senate for a vote — and Republican lawmakers there probably hope adding a provision stipulating that the law does not allow discrimination based on sexual orientation or gender identity will save them from additional national attention. If a civil-action lawsuit were filed against a business denying service, the law would not offer legal protection. None of the changes apply to religious groups. The fix will not add any new protections for LGBT residents that did not exist before the law. Several of the businesses and organizations that opposed the law have signaled support for the announced changes. However, the original law managed to do quite a bit of damage to Indiana’s economy during its brief life. Three states enacted bans for official travel to the state, and several conferences were canceled — including one planned by the Disciples of Christ. Wilco canceled a performance planned for May, as did comedian Nick Offerman. The “largest tabletop gaming convention in North America” announced it was rethinking its relationship with Indianapolis.